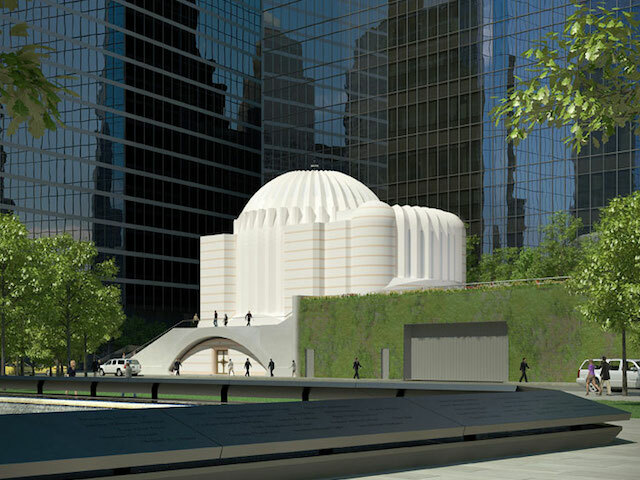 Santiago Calatrava— the Spanish architect whose designs graced the Athenian skyline during the glory days of the Athens 2004 Olympics— has been selected to design St. Nicholas Church in New York City— the only house of worship destroyed in the September 11th terrorist attacks. The original St. Nicholas Church— a tiny building catering to a historic community of four generations of Greek immigrants and their descendants who once occupied Lower Manhattan— was crushed when the south tower of the World Trade Center collapsed. Plans to rebuild the church have faltered, due to government red tape, in-fighting between agencies and governments, as well as the complexity of the issues that surround the site including construction, jurisdiction, security and more. Images published by Calatrava featured a building that draws inspiration from the great Orthodox Christian churches of the East: Hagia Sophia and the Church of the Holy Savior in Chora, both in Istanbul. The shallow dome of the new St. Nicholas Church will have 40 ribs, as does the dome of Hagia Sophia. Alternating bands of stone on the corners will echo the walls of the Chora church. Though both date to the early centuries of Christianity, they both were later used as mosques before becoming museums— a connection that has some observers and commentators on various blogs angered at the possible connection. The New York Times suggested that a new debate would arise about the structure, and whether of not it was appropriate for the site. The newspaper continued: “That a Spanish architect should design a modern Byzantine church in Lower Manhattan for the Greek Orthodox Archdiocese of America, based on buildings in Turkey that were used for Islamic worship, goes to the heart of the message the archdiocese says it hopes to send with the $20 million project. The new St. Nicholas is to open by early 2016. Comments on the website of the TriBeCa Citizen show that some viewers already say St. Nicholas resembles a mosque. Father Arey told The New York Times that he would welcome the dialogue ahead. Controversy aside, I find it forbidding and unattractive.